What's the weirdest soda you imbibed? We call it 'pop'... the weirdest until I tried it, now a favourite. The (other) Scottish national beverage. Say the name "Iron Brew"
There are many places in the southern U.S. where there are dry counties. You can go into little country stores in such places, and in addition to the usual colas and lemon-lime drinks, they'll have 20 or 30 kinds of soda pop in fruit flavors, and other flavors. I'm talking strawberry, peach, blueberry and so forth (and of course, there's orange and grape). The strangest I ever drank was Yoohoo, which is chocolate flavored--allegedly. Once was enough for me, although I understand that it's very popular, especially with the little kids. I used to like Tizer when I was a kid, still like it now and again. Ee Bah Gum, Dandelion and Burdock. Bit of an acquired taste, closest thing in America would be Rootbeer or Dr Pepper. Having said that I don't like either Dr Pepper or Rootbeer, but I'm quite partial to the odd glass of D&B. Fentiman's sells that here in the United States. I love both root beer and Dr. Pepper ... so, I'll give that a very enthusiastic try the next time I stumble across it. Pommac is the brand name for a carbonated soft drink made by Carlsberg Sverige AB of fruits and berries and matured in oak barrels for 3 months. The name comes from "Pommery", referring to Champagne, and Cognac, as it is matured in oak barrels like wine. Another theory of the naming is the French word pomace, which literally means remains of pressed fruits. See also Ripasso. The recipe is kept a secret. I think fentimans might be alcoholic. The (relatively) new Cherry Dr. Pepper is good. As for root beer, there are so many different brands, almost all of which taste different, that it would be foolish to say that it tastes good or bad--which brand tastes good (or bad)? The Girl and I came to the conclusion that we like the Mug brand best. A & W, right from the soda fountain is very good--the bottled stuff ain't so hot. Not their sodas. No. I have yet to see their alcoholic beverages on sale in NYC. Their ginger beer is my favorite soda (stated many times on a2k). 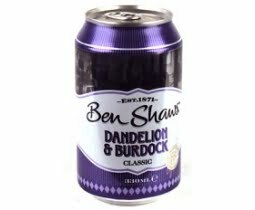 Have you tried dandelion and burdock yet? This stuff is almost an obsession in Scotland, but Trump has banned it from his Scottish golf clubs because it stains. Expect it to make an appearance during the protests. I am a failure in this department. If I find myself in the vicinity of the one store that I know sometimes has it? I'll make sure I'll visit it on this account.